In preparation for the opening of "Observing (A)trophy Life - Celebrating Our Luxury of Social, Personal and Political Addiction" at Leon Gallery in Denver, Colorado of June 2016, gallery curator Camille Rose Shortridge went behind the scenes for 10 days in my studio and hometown. She proceeded to interview me and conduct research based on my artistic practices and the meaning of my work in relation to my environment. The following are photographs taken by Shortridge, and her descriptions which were posted everyday on Leon gallery's Instagram page as a successful and innovative social media experiment. Enjoy. "Starting tomorrow, follow us on a 10 day journey behind the scenes of the curating and making of the upcoming exhibition by Texas based artist David Freeman. @camill_ionaire , who will be curating this exhibition, will give you glimpses inside the artists' studio and take you around the border land region of South Texas, a culturally rich area which heavily influences his art. Follow her from Texas to Denver in preparation for the Opening Reception on June 18th." Day 2 (1/2): In the Studio with the Curator. Location: The Artist's Studio. "Curator Camille Rose Shortridge speaks with the artist to learn about the powerful significance behind the artwork. Here, they study one of David's trophy pieces, dissecting each icon used as to better familiarize herself with the different meanings and interpretations that they symbolize in both American and Mexican folklore culture, and within his own artistic ideals. Stories were shared, as when David recalls traveling to an old abandoned town in Mexico where a mountain side was carved out to display a shrine of offerings to various Saints, including offerings of oranges, mounds of braided hair, and alcohol. Visit the next post for more information about the specific spiritual and religious Patron Saints that David incorporates." "When viewing David's art, it is important to keep in mind that he creates these powerful scenes of contradiction without any judgement. Although satirical, he is presenting to viewers such scenes of terror in order to create a platform for conversation. He intends for you to ask yourselves questions such as, "what is the difference between the legal drug cartel in America (i.e the pharmaceutical industrial complex) to that of the illegal drug cartel in Mexico?". Addiction, greed, death and abuse are present in each. He asks us to question what's really going on in our own society by using similarities and differences of the culture that surrounds him, that of Mexico. Catch us tomorrow as we take a trip outside the studio, into the streets of the borderland. Thanks for following." "We just crossed through a mandatory border patrol check point which are established near Mexico / U.S borders. The border patrol guards check vehicles for illegal immigrants and drugs, as well as conduct safety searches. Here is the conversation that ensued: Border Patrol Guards: "Are you two U.S Citizens?" Us: "Yes, sir"
BPG: "What are you carrying in here?" Us: "(small laugh) border patrol piñatas" BPG: "(smiles sarcastically) You going to sell them?" Us: "Yes, it's for an art show in Denver. We've got one on a horse and two standing." BPG: "Would have been better if they were different piñatas." Day 1 (1/2) : Meet the Artist and His Studio. Location: The Artist's Studio. "Meet David, he's a professor of photography at South Texas College. He travels back and forth from TX to Mexico where he shops at flea markets and yerberias to acquire religious relics, found objects and folklore trinkets of Mexican heritage - for the assemblage of his drug cartel inspired trophy art. The piece behind him represents "La Bestia" a.k.a "The Beast", a train taken on a deadly voyage from Mexico to the U. S border by migrants. Stay tuned tomorrow as we take a deeper journey into his work environment and his social political artwork. His studio is as eccentric as his long hair." ""Laying on the artist's work table is a miniature photograph of Jesus Malverde, waiting to be mounted onto a trophy piece. Jesus Malverde is a folklore hero in Mexican culture, known both as the patron-Saint of Mexico's drug cartels and as the Robinhood figure of the poor, a.k.a "Angel of the Poor". In Catholic religion, Patron-Saints are chosen as special protectors or guardians over areas of life. David uses images of these Saints, along with La Santisima Muerte, to realize the grandeur meaning behind this exhibition: one of juxtaposition and contradiction of the war on drugs which is a symbiotic relationship, a push and pull system, between Mexico and the United States. We will see you tomorrow for a sneak peak of one his works." "Shown here in the newly developed entertainment district is one of a handful of hierberias. The magic found along this street lies in the blending of the new culture with that of the old. Locals say there's no other place like it in the country. Next to newly established nightclubs, you'll find an 80 year old bakery or an herbal shop, offering "limpias espirituales", a spiritual cleansing. This particular Hierberia invites us to "Come and be amazed", get our tarot cards read and get involved with a little bit of "brujeria". Items for purchase include herbal remedies for illnesses, and candles that offer aid in pregnancy, finding love, getting rich or putting a spell on enemies." "Gallery director @ericrobertdallimore caught in action, installing David's life size trophy installation. As he describes it, Leon is being transformed into "The Mexican Versailles". 3 days left till the opening!" Day 1 (2/2): Meet the Artist and His Studio. Location: The Artist's Studio. "Welcome to David's studio. It used to be an old baptist church, which he renovated into a living quarter, a studio space and a functional art gallery. 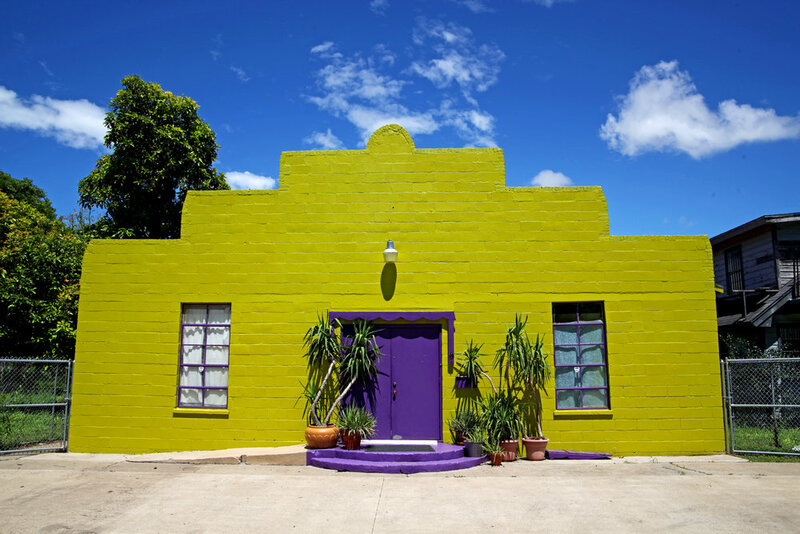 It's brightly colored exterior walls mirror the vibrancy of the objects and space found inside. See you tomorrow as we enter this whimsical space." "Pictured here atop one of the artist's pieces, is a coyote, a girl and a barbed wire fence. What you are seeing is the unraveling of a "coyotaje" scene, the practice of human smuggling across the U.S. - Mexico border. The smugglers are knows as "Coyotes". Many of these Coyotes are members of international drug organizations who are in this practice solely for profits. Migrants pay between $5,000 to $12,000 each to get themselves or a family member smuggled into the U.S. The journey faced by many is thus one of terror where robbery, extortion, and death are common. [continue on to Part 2 of Day 3]." "Today was a busy one, as David put the finishing touches on his pieces, with the help of these two lovely ladies. All three professors, all three art enthusiasts. Tomorrow the work is being packed and shipped to be sent off to Denver!" "It's all about the details! As we prepare for the opening tomorrow night, we'd like to encourage everyone who will be at the gallery to take a special moment with each individual piece on exhibit and look at the magnificent details! David's art is an assembly of small objects, often minuscule. Soldiers, body parts, Saints, animals, ect. Keep your eyes open!" "Thank you to everyone who stopped by last night for the opening reception of "Observing (A)Trophy Life - Celebrating Our Luxury of Social, Personal and Political Addiction" by David Freeman!! We had phenomenal response. We are open today from 12-5pm for those who couldn't make it, and the exhibit will be on view until July 16th."